Over a longer period than I sometimes care to contemplate I have worked on possible-worlds semantics. The earliest work was in modal logic, to which I keep returning, but a sabbatical in 1970 took me to UCLA, there to discover the work of Richard Montague in applying possible-worlds semantics to natural lan- guage. My own version of this appeared in Cresswell (1973) and was followed up in a number of articles, most of which were collected in Cresswell (1985b). A central problem for possible- worlds semantics is how to accommodate propositional attitudes. This problem was addressed in Cresswell (1985a), and the three books mentioned so far represent a reasonably complete picture of my positive views on formal semantics. I have regarded the presentation of a positive view as more important than the criticism of alternatives, although the works referred to do contain many passages in which I have tried to defend my own views against those of others. But such criticism is important in that a crucial element in establishing the content of a theory is that we be able to evaluate it in relation to its com- petitors. 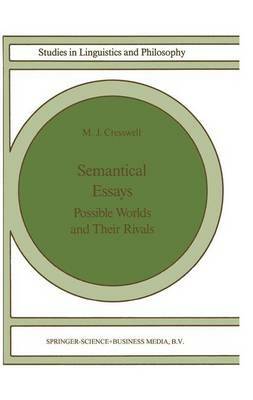 It is for that reason that I have collected in this volume a number of articles in which I attempt to defend the positive semantical picture I favour against objections and competing theories.